Didn't want to get rid of my Damien Hirst skull nails but needed to do something with my hands otherwise I believe my head would have exploded due to the wanton desire for nicotine I was having. 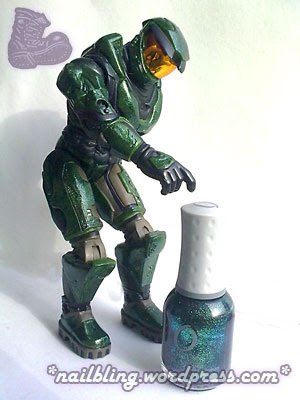 Here is the Master Chief wearing some Orly Meet Me Under The Mistletoe -- this is the armour upgrade he's been waiting for for years and years, though I reckon he could have done with another coat. I don't think that his new paint job will stand up to the trials of battle and sticky grenades and marines driving Warthogs but it looks grand and I still want a cigarette but I'm going to get some Nubar Absolute instead. Yeah.